Google+ is the new Social Networking project by search engine giant Google. Its something like Facebook with Stream and Photos. A new and unique feature in Google+ is the Circles which lets you add people to your circles with drag and drop. I will discuss more about Google+ in a detailed post. I was using Google plus for 30 minutes now and I found it much like Facebook. But I still have a lot to explore in it. Google has invited only a small number of people to test their new project. Now the users who have joined Google+ can invite others to test it. I have also got one invitation and I have many invites left. So I’m sharing it with all of you here. If you want a Google plus invite then leave your comment here with your Gmail ID and I will send you the invitation to test this new social network by Google. To make sure that you get an invite quickly, do share this post on Twitter and like it on Facebook from the buttons at the end of the post. Retweet this post using the buttons at the bottom of the post. Click on +1 button at the bottom of the post. Leave a comment with your retweet URL. Hi, I have been looking for an invite to Google Plus, would you mind sparing one? hey plz send me a Google+ invite am sharing this post in fb and twitter..my gmail id is skumar165[at]gmail.com ..thanks in advance.. I really want to try Google Plus, please send me an invitation. Thanks! Would love an invite — Google plus sounds awesome! nice ! invite me pls ! hi, i need a invite, please send me 1…. Sent invitations to all the above commentators. Hi, I’m also looking forward to get one invitation, is it still possible? please invite me ! thanks ! Please send me an invite. brenthageman@gmail.com. Thanks in advance!! please send an invite my way. Can I have an invitation please? I guess I’ll have to wait a day or so, but I’m in! I’ll be happy to get invitation for Google+. Thanks a ton for the invite! Anyone has an idea what they mean by ‘soon’, I mean when do they want us to check back? Could you please send me an invitation, too? Hi, I work in IT and I would be very happy if you could give me an invite…. Hi man! Would love to have a invitation as well! Any left? I put my EMail into the Form. Please send me an invite. Thanks. hi Simrandeep, I would love an invite. thx! Hey it sure would be interesting to do a decent try-out of Goggle+. However, i might be a bit late with my wish here. Thank you, Google ID: mikispag . Would be higghly interested in an invite. Thank you very much. could you invite me too in Google+. I want to Test it. Could you invite me to google plus? pls send me goolge+ invitation. Plese send me invite. poscam [at] gmail.com Thanks! Can I have an invitation please? Thanks a lot! Thanks alot – rbmulder@gmail.com !! I’d love to have an ivite. Thanks! I am also interested in. Can i have an invitation? if you can send me an invite i’ll be thankful. Hi, do you have some invitations left? I’d appreciate that 🙂 eikeduevel[at]googlemail[dawt]com. I’m also looking forward to get one invitation, if possible…. i will be pleased to have an invit. Would u invite me pls? Hello ! I’m looking for a Google+ invite. Please send me one. Thanks ! Would bei very cool, thx! Would love to have an invite please… Thanks! hi ! i would be happy to be invited! Would be very grateful for an invite, thx! May I have one, too? Hi, thank you for your offer. Please send me an invite! Would be great to get an invitation, do you have one left? Am lookin forward to trying it out! just love it and would really try it out! thanks!! really excited to see google plus.. Please invite me, thank you very much! Hey ! Could you send me an invite ? Thanks ! I would appreciate an invite from you. I’m struggling to get a google plus invitation, that would be great if you could send me one! I’ll pass an invitation to many others too !! Hi Bro!..Thanks for the oportuniti to try this new Google Product. Hi, I looked at your contribution. one more Google+ for me please!! Many thanks in advance, can’t wait to share this with everyone I possibly can. matt1125 is my ID if you would be so kind. Thanks. Would love to test g+ too! Please send me an invite, thanks! Hey, my email is jesi.roben.debua[at]gmail.com. Hi could you please invite me, too? Hi Simrandeep, please invite me as well! It’s very nice from you to share this experiment. Please invite me, Thx a lot! Please hande me an invite. You’re so kind. I hope you get something good out of all the traffic I assume you are getting these days. hi, please send me an invite too. do have an invite for me left? I have shared this post on twitter and facebook. may i have one ? Thanks a lot ! Would love to recieve an invite for Google+…thanks in advance,. Hi, could u invite me ? Hi Simrandeep! Could you help a fella out with an invite? Or maybe somebody else can? Thanks in advance – looking forward to try something else than Facebook! hi, i’d love to get the invitation too.. I would like a Google+ invitation. Thank you in advance! I’d like to get an invitation! Want to test it! Hope you could send me an invite. Thanks. I would like an invitation 2, would be nice if you could gimme one. My email is espaniard@gmail.com. I would retweet you but I have no twitter account. I want to get an invitation! thanks! I would like to get an invite! hi, can i have an invitation? If you have some invitations in stock : anthony.lejuez at gmail.com ! Please send me an invite. est.eugene[at]gmail.com. Thanks in advance!!! My id is hunyadym. Thank you very much! I’d like an invite! G+ seems awesome! Thank you in advance! Will pay it forward! Sent you all invites for Google+. Check your inbox. Hello please send me a invite. I’m andres.yeah, I want to try it! Nice blog & greetings from France ! A invite would be great! Thank you very much for the invitations. I can’t wait to test this new service. I’d like an invitation please!! I would like an invitation please. Thank you so much. Can i get one invitation pls? pls. give me an invitation to join……..
please can i get an invite? Received the invite, but google plus page is just the same, “keep me posted”… Oh well, guess I’ll just have to wait and see… 🙂 Thanks Simrandeep, as this should get me inside google plus faster anyway. I would like an invite for Google+! Any invite for me please? Hi, I would appreciate an invite. I would like to receive an invite. Could you send it to andrea[dot]marucci[at]gmail.com thank you? Please send me an invite, pretty please! you have 1 invite to give me ? can you send me invite please. Hello Simrandeep, I would really appreciate if you could send me an invitation. Thanks for your help! My ID is holger.krumm! Could you plz give me an invite? Would love an invite! Thanks so much! Thank you for the fast invite. But it’s not working already. could you send me a invitation please? thanks..
i would really like an invite. I will post this on twitter and facebook. please send me an invite, Thanks in advance! please!!!!! I´d like an invitation!!!! I’d really appreciate it if you could invite me. My gmail ID is israelbe. Can you please send me invitation. 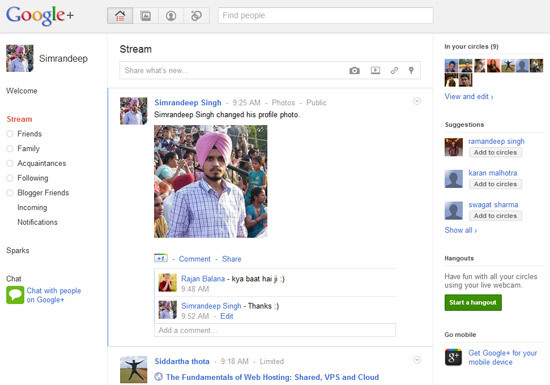 Google+ looks pretty good and very interesting. Any chance to have one? Check your inbox for the invitation. Hey maybe you’ve got one invitation left? Thanks for the invitation, I am sharing this on my FB for a friend in Madrid working with social media desperately in need of an invite! I’d like an invitation plz! Hi, i would really really appreciate an invitation!!.. Looks good! Invite me please! ANy chance for invitation please ?? ay i can’t able to use ur invitation… showing error:- Already invited? We’ve temporarily exceeded our capacity. Please try again soon. Watchout to beeing logged in the right account while hitting your link. Simrandeep could you plz send me again a invitation? Would be great. and sorry for the wasted one. I would like to try the Google Plus too. Could you send me an invitation either please? Have another free one? I would like to testing new Google service, please send me invitation. thanks for your invitation !!! could you please invite me too ? 😉 Thank you very much!! I think it’s great that you’re offering Google+ Invites! Can you please invite me , Thank you! Could you please send me an invite to michaela [dot] kunclova [at] gmail [dot] com ? I would like an invite but this invite thing is crazy. Please send an invitation to me. They currently seem to be over their capacity though. Too many respondents I guess. Can someone invite me to google+ THnX very much!! Simrandeep Singh you are the best, thanks a lot for your invite. It looks like we need to wait now until is ready again to accept our invitations. Can you please invite me. kartikrulz@gmail.com….plz send me one invitation.. I would like an invitation too please. thanks. Can you please invite me, Thank you! A goole + invitation pls. Could you send me an invitation please. Thanks! Could anyone invite me please? Thanks a lot! I would really appreciate it, Simrandeep. can u send me invitation please? Hey i’ve done all of your requests, could i get an invite? Thank you very much! I have invitation but i can’t join ?? i got a email with invitation but its not work??? Would love an invitation, this thing looks like the future! bl3ad1ng (dot) h3art (at) gmail (dot) com send me invite please. Thank you very much! Can I have one invitation ? I would LOVE a invite please please please ill do anything!!!!! I AM A HUGE FAN OF GOOGLE! Can you invite me please! It does not WORK do you know why ? Im invitated but it tells me about comin soon. Someone the same ? I would love to have one invitation. Thank you so much ! Please invite me … i really need it. I would like to get an invite from you:) i have already retwitted yr post, thank you in advance! REady! I did everything, can u invite me please? Give me a chance. thanks. Could you please send me invitation. Thanks in advance. mromarahmad@gmail.com this is my pubilc email. Please no spam! I have liked your posts and added +1. But I don’t have any retweet account. May you kindly invite me to Google Plus? Thanks! Please you please invite me to Google+. Hey I like if you invite me :)> Thanks. Can u invite me plz?? Thanks! please sir send me an invitataion for joining google plus. if still possible! ?, thanx anyway!! So people are finally getting hands on Google+. We got the chance to. So for the people who still didn’t get it. Comment you email here and we will invite you right away. man! i’m thankful to you i got the invitation. i’m keeping refreshing the page to get access. Can you please invite me? I have all steps done. Hello, i want it now, thx. Plz send me one.. I ll invite the others..!! Thanks in advance. Will pay it forward!! please imvite me, i have twitter this. Hi can I please get an invite too? İ want invitation,can you help me to get an invitation..thanks for now..
hi .. can you please invite me to google pluse ? kejehe@gmail.com – please invite me 🙂 thanks a lot. Please invite me. Thank you so much. Hi send me an invite plz … Thank you !! Could you please get me an invite? I completed all needed steps ! Please, I’d like an invitation, too. Veryvery please for invitation to google+.. Please, could you invite me? R u really sending invites or blackmailing people with non sense marketing tricks? Ill be glad!! Thank u! Pls …can you send a invitation to sigmarfrotafilho@gmail.com . thx. Please get me this invitation techcrunching to test it. Please invite me, I wish to try that. I think I did everything OK.
iwould be really thankful…..pls spare one if you can..! Retweeted and followed all instructions. @GoldenC88 is my twitter. alanthomasliddell is my Gmail acct. Thanks! please send me an invite. Thanks in advance! Could you please send me invite? plz invite me to google +. thnx! I deleted my facebook account but I did tweet the url. Please give me an invite. I am ready for a revolution! Kindly send the invite to this id. please invite me, my email is: trungnguyen2809@gmail.com thank you! Please I want to get invited soon!!!!! I wonder if you will invite me, which would be quite awsome! I really need an invite.. I will be very happy if anyone want to send me one! I’m longing to use google+ so please invite me!!! Please invite me: marciavindel@gmail.com. Thank you so much! I sent invitations to most of the commentators. Due to large number of comments it is not possible for me to send invitations to all who comment here. I’m noticing that most of you are not statistical the conditions to get invitations. Please follow all the instructions given in the post so that you get an invitation for sure. i also clicked +1, liked this on fb, followed you on twitter and liked your page on facebook. Invitation sent to all the above commentators with valid Gmail IDs. send me invite .. adolfhardik@gmailcom . . like the page . .
please invite me.google acount is ken.ishima. Invite me to pls my email. please send an invite… thanks! Please send me an invitation. Thanks! Please, invite me. My id is aviranzerioniac@gmail.com. please, send me an invitation..
could you please send me an invitation for google+? Thank you! I’d really like an invitation id.achraf@gmail.com. Thanks in advance. Please send me an invitation for google+? I’ve done everything expect the last task that i didn t understand. would you please send me an invitation? I would love to have Google plus invitation! Thank you for advance! Hello, please send me an invitation. I would love to have Google plus invitation! thanks in advance. Hi, would you please send me an invitation? My gmail address is in the e-mail field. Thanks very much. Please send me a google plus invite. I need one too. mapdesign15[at]gmail.com Thanks! I hope google + is a better answer to SN than Facebook. Thank you very much for an invitation. An invitation here also please! please send one invitation here! Give me a Google Plus invitation, please!!! Many thanks for you . . I would love an invite. Thanks for your time. please buddy….i need an invitation…..please send me 1….. I would really appriciate an invite. made a new id just for g+ after having a look at your site…. i must mention this site is a cool one….. many things at once…. a suggestion for u include sme kind of online shopping here too…. hey add me on g+…..